Hey All, I hope you had a great new year! Pairs of brackets and block deliminations now count as one token each, and local declarations do not count at all. You can now fit in around 30% more code because of this, and there is less need for odd space-saving techniques (e.g. using blah"" instead of blah()), or getting rid of local variables. It does mean you're more likely to hit the compressed code limit (use INFO to check), but I don't think this will be a problem. The raw character limit has also been increased from 32k to 64k. import() and export() can now load and save the sprite sheet: export("something.png") and sfx: export("something.wav"). These aren't very flexible yet, but in future they'll be able to do things like grabbing particular sets of sprites, or only importing into empty slots. Voxatron 0.3.4 builds are live on the updates page and on Humble. This is a quick bug-fixing update, mostly responding to issues in the 0.3.3 thread. I've been doing some spring cleaning, and updated all of the older Lexaloffle games: Neko Puzzle (which is now free), Swarm Racer, Chocolate Castle, Zen Puzzle Garden, Swarm Racer and Swarm Racer 3000. If you had any trouble running these games on newer versions of OSX or 64-bit Linux, these versions should work out of the box. SR3K also has some new wall rendering and analogue joystick support. I've been chipping away at it very sporadically but it's on slow burn until after Voxatron is finished. An 8-track preview is available to any Lexaloffle customers. You can find downloads on the game pages, or your updates page / Humble Library page. User-made ZPG and Chocolate Castle puzzles are also back up with new HTML5 players. You can post puzzles by saving them to clipboard and then pasting the puzzle text into a BBS post. EDIT: 0.3.3b patch is now up; if you tried 0.3.3 from a clean install and got stuck on the title menu, see this post. 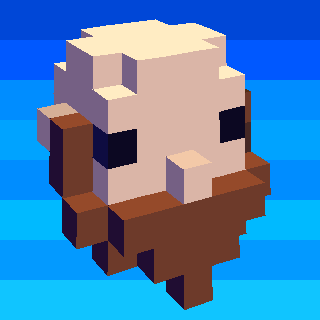 Voxatron 0.3.3 builds are now up! Check your updates page for downloads, now including a native 64-bit Linux version. Builds should be up on Humble soon too (check the version number on the files). Main new features of interest are: integrated music tracker, custom inventories, multiplayer selection and room transition logic, new microscripting events and better activation control, improved water physics. Check out cartridges in the ALPHA CARTS menu: The Jelly Room, Chaos Fortress to see some of these in action. I'll post a more complex demo of custom inventories and weapon switching soon. 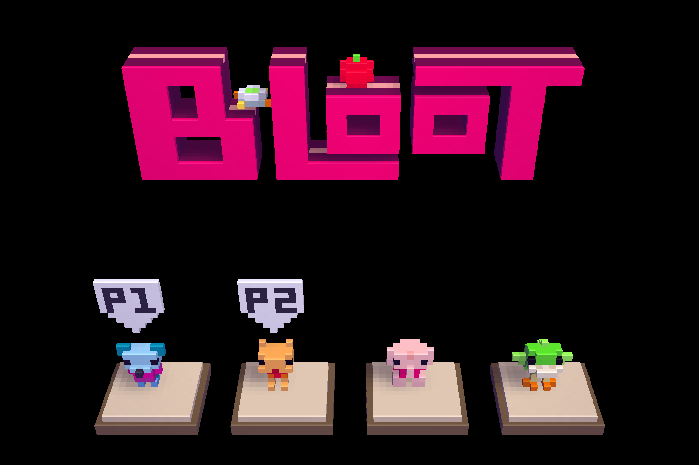 Bloot (also under ALPHA CARTS) is now completely playable as a 2P-4P game, with match scoring and end-game logic completely made from microscripting. To select a player, press action once to join, and then once more to select the player (or left / right to change selection). If you want to try it out without a second human around to play with, you can join P2 and then hoist and carry them through the door to begin the game. There's a script editor in this version (under the new NEW OBJECT fold-out menu), but it doesn't do much yet. Scripting is the last major component of Voxatron engine, and v0.3.3 contains a lot of new code to get it working -- all of the interactions between objects now run through an abstracted event layer because of this. This affected many legacy carts, and I'm still working on improving backwards compatibility. For a top-level view of the project's progress and what's coming up, check out the new feature-wise Development Map. In the short term, check back for more demos, tutorials and documentation! Here's the final changelog for 0.3.3, which will be live on Monday. The first PICO-8 Jam has ended, and peer ratings have been tabulated and verified. Thanks so much to all participants for making the jam a wonderful event and for producing an excellent collection of rain-themed cartridges. It was a close one, with only a difference of 0.04 PICO-8 stars (out of 8) between the two highest-rated entries. 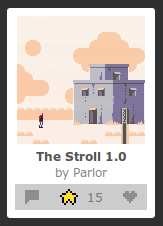 With an average of 6.92 stars, the winner is.. drumroll..
Congratulations JTE, and you'll be receiving a small prize in the mail from PICO-8 HQ -- a commemorative plastic coaster depicting your cartridge, along with a PICO-8 canvas bag. Also close behind were Rain Culture by NuSan, Tea by moonmagic, and the equally heart-melting Rainy Day Friends by electricgryphon. Stay tuned for the next Jam, which will be in the first quarter of 2016. And if you're not burnt out from jamming or missed this one, join me for Ludum Dare this coming weekend! You can view all of the P8JAM1 entries here, or directly play the carts mentioned in this post below. You have 9 days. Good luck! There's a new version of the BBS live now. It's still a little rough -- let me know in the comments if you find something weird going on. I'll be tweaking and extending it over the next month or so. Cartridge view. Carts are listed in the order they are posted rather than in the order of thread activity. On your profile page, click "Cartridges" and then "Edit Cartridges" for more information and to release your carts under CC4-ATTR-NC-SA. There are now blog sections for Voxatron and PICO-8, so that users can post relevant projects that aren't carts, or post about events etc. -- things that don't feel quite right under 'Discussion'. It's still possible to post your work that isn't related to anything Lexaloffle, but might be of interest to other users. 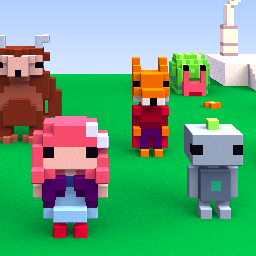 The Voxatron and PICO-8 user blogs are empty right now, but I'll go through and re-categorize existing blog posts soon. These are now a little easier to use, and tags show up on the thread previews. This is still a WIP -- I think tags will be important later for things like searching for music to use in a cartridge, or for tagging carts with a particular event (like a game jam). You can find it on your Updates page. The new builds should be up on Humble soon too (check the version numbers on the files). This is a quick bug-fixing update. Due to a rogue dev-debug-mode flag being mistakenly switched on in 0.1.2, much of the standard Lua library was accessible. 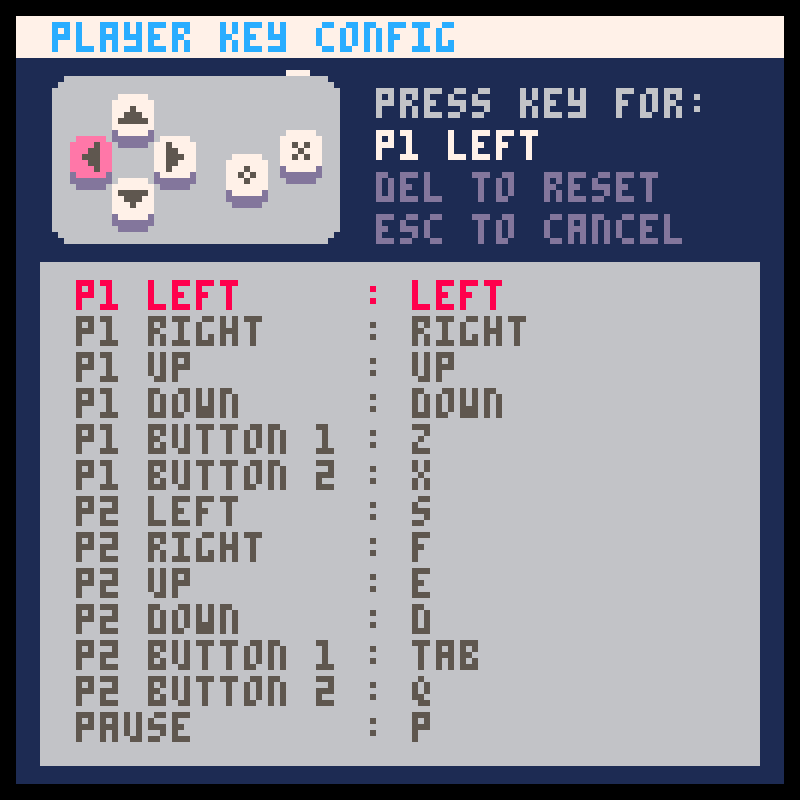 So if you've started using PICO-8 recently, not knowing the library is not supposed to be there and tried to use it, sorry about the confusion! Note: If you bought PICO-8 (rather than Voxatron), it isn't possible yet to activate your Lexaloffle account from Humble. 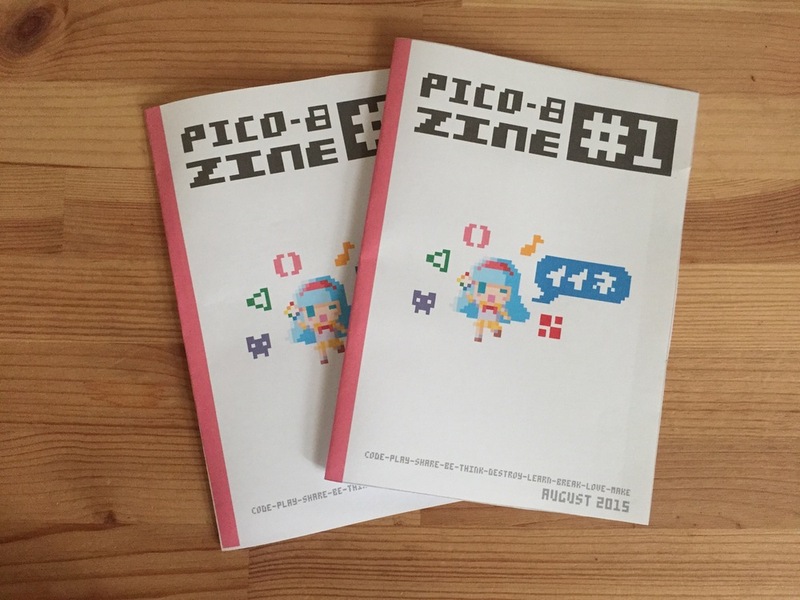 I've been activating accounts manually, so if you purchased PICO-8 very recently and don't see it show up yet, please check back in a day or so. The Humble Bundle library builds should be live soon too. New stuff: HTML5 exporter, 8-player joystick support, cartridge save data. note: Saving doesn't work in the web version yet! Just a quick note for blog-checkers, Voxatron 0.3.3 and PICO-8 0.1.2 are both arriving this month. I'll go into detail about new Voxatron developments and plans after the update's out, but here's a quick preview until then. Also, here's the current changelog for pico-8 0.1.2. There are still known issues that I've rolled over to 0.1.3 but let me know if I missed something small that's easy to fix! Seeing what kind of heavy splashy snare I can get with multiple sfx channels. As usual, please use or adapt the music for something if you like.